Think you can't do a Tough Mudder? Caroline Miner might disagree. We get a recap of Caroline’s journey from being totally terrified to boldly facing what is probably the toughest event on the planet. 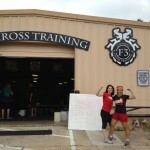 Listen in for inspiration and learn how you too can join our FRN team that will run Tough Mudder Nashville in June 2014. Few will take the challenge. But you can be among the fearless FRN runners. Just ask Caroline! It took many, many months of convincing but Caroline joined team MAS MUD and she actually showed up for Tough Mudder Houston on October 5th. She not only showed up, she rocked it!! TEAM FRN BIG SHOUT OUT! TEAM FRN is building!! Lisa Jarmon, Scott Anderson, Stacy Knickerboker, Cynthia Krom, Aaron Krieger (We Like Shooting podcast), Zeke and Lefthand (Talking Lead) are all paid up! We are TEAM FRN! Who will be next? Will it be you?? Join us! Register to “join and existing team” and search for team FRN. Email me at carol@fat2fithq.com for the team password. THANK YOU Jessica and Kristen from Sparkpeople for all the great show feedback! 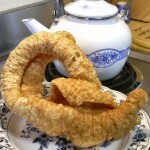 Here is a ‘different’ kind of thing I like: Fresh pork rinds from Pancho’s Meat Market in Houston.